‘No Man’s Sky’ Review – Spotlight Report "The Best Entertainment Website in Oz"
One of the most anticipated next-gen games, No Man’s Sky, has finally landed. This is a game that promised the ultimate and unique open world experience for gamers. Developed by Hello Games, No Man’s Sky has a reasonably basic premise: what would you do if your ship crashed on an unknown planet? Players are prompted to intuitively work out the game’s mechanics, making decisions that ultimately affect the journey, including exploring planes, discovering and naming native flora and fauna, mining natural resources, locating beacons and shipwrecks, and trading items in return for necessary upgrades or ship parts. Additionally, while in space, characters may be set upon by pirates, while there are random drone attacks on land. The problem with No Man’s Sky is its lack of a storyline. While it’s true that the point is to create your own adventure, a suggested path or even a “history” mode would be highly beneficial for occasional gamers, who might simply prefer to discover the secrets of “Atlas” (e.g., beacons pointing the way towards mysterious civilisations, and some native words to expand your galactic language). Overall, No Man’s Sky is a blast if you have a lot of time on your hands and are a fan of open world games. However, don’t expect stellar graphics, epic battles or a rich sci-fi storyline like that of the Mass Effect saga. Baroness will be returning to Australian shores this December! 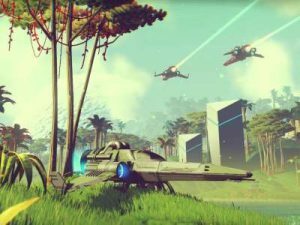 What do you do in No Man’s Sky on PlayStation 4?